Should You Exercise When You're Sore? Soreness happens to everyone, especially if you're new to exercise or are trying a new activity, but what happens if you're sore and you have a workout coming up? The short answer is that it depends on how sore you are and what kind of workout you're doing. If you're very sore: As in even your hair would hurt if you brushed it (and that's if you could lift the brush), you overdid it and even small movements will hurt. Your soreness may be worse on the second day, so take at least two, perhaps three, days off and try the tips listed below in dealing with muscle soreness. On the third or fourth day, try light cardio (e.g., walking) or a lighter version of the original workout you did use lighter weights or no weight, fewer sets and less intensity overall. If you're noticeably sore: Either take a rest day or try a light cardio workout and stretching the next day. If you're a little stiff: Try a light to moderate cardio workout along with stretches for the stiff muscles. 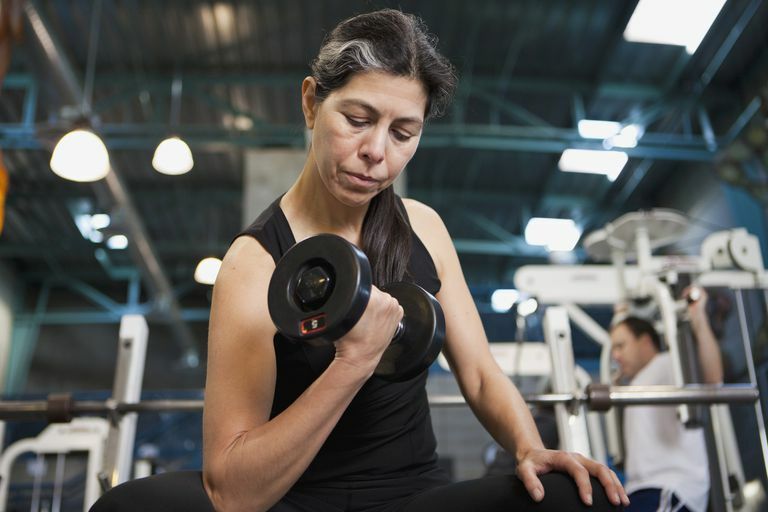 Muscle soreness (or, in fancy terms, delayed onset muscle soreness) is natural when you challenge the muscles with new exercises or more intensity. When you put new stress on the body, it adapts so it can handle that new load. Part of the adaptation process includes muscle soreness, microscopic tears in the connective tissue that support and surround the muscle. Sore muscles are in the process of healing and growing stronger, so you should avoid stressing them even more by doing heavy, intense exercise. However, a light workout may offer some temporary relief as you warm the muscles and create more blood flow. Light exercise: Some studies suggest that yoga, light weight training (using no weight or very light weights) or light cardio (e.g., walking) may help reduce symptoms of DOMs. Massage: Though studies are conflicting, there are some studies showing that massage might alleviate some muscle soreness. Anti-inflammatory Medication: NSAIDs such as ibuprofen can reduce pain and inflammation. There are side effects, so talk to your doctor before taking any anti-inflammatories. Ice Baths: There are also conflicting studies about ice baths, but some studies suggest they can improve recovery from DOMs. Whether you can tolerate sitting in a bathtub full of ice is an entirely different question. Time: Time is the one thing that works every time. Most soreness will ease after about 2-3 days, allowing you to get back to your workouts. It's impossible to completely avoid muscle soreness, especially if you have a goal to lose weight or change your body. However, keep in mind that the recovery process is just as important as the workouts. It's during your rest days that your body heals and grows stronger. It can't do that if you don't give it enough rest. Ease into your workouts: Start slowly to allow your muscles to gradually adapt to the stress of new activities or intensities. This is especially true if you've taken a long break from exercise. Going back to the workouts you used to do may be too much for your body. Gradually build intensity: To get in shape, burn calories, and lose weight, you have to challenge your body with more stress than it's used to, one of the things that cause soreness. If you're a beginner, any activity is more stress than your body is used to, so you may need to stay with the same workouts for 1-2 weeks before adding intensity. Be consistent: Once you've gotten sore from a specific workout or intensity, you shouldn't experience it again until the intensity is increased. Continuing to workout regularly will help you maintain that level of strength until you're ready for more intensity. Boyle, C.A., S.P. Sayers, B.E. Jensen, et al. The effects of yoga training and a single bout of yoga on delayed onset muscle soreness in the lower extremity. J Strength Cond Res. 2004 Nov;18(4):723-9. Nosaka, K., and M. Newton. Repeated eccentric exercise bouts do not exacerbate muscle damage and repair. J Strength Cond Res. 2002 Feb;16(1):117-22. Is It Safe to Cycle When You’re Sick?